In what arguably represents one of the defining examples of their alternate reality when analyzing the Israeli-Palestinian Conflict, the Guardian has been running a series of posts highlighting the 70th anniversary of the United Nations, including the following report by their Jerusalem correspondent on the ‘best bits’ of the UN. Yes, that’s right. UNRWA (United Nations Relief and Works Agency) represents, to Beaumont, the ‘best’ of the UN! As we’ve demonstrated in multiple posts, the opposite closer to the truth. In perpetuating the “refugee” problem for decades, no one single international agency has done greater harm to the search for peace in the Middle East. Unique among the main UN organisations, the United Nations Relief and Works Agency was set up to deal with what was then regarded as a temporary refugee problem, and an individual one at that: the plight of Palestinian refugees. Established in 1949 the body was mandated to carry out relief and works programmes supporting about 750,000 Palestinians who had fled their homes in the conflict, which was triggered by the establishment of the state of Israel. Of course, what “triggered” the refugee problem was not Israel’s creation in 1948, but the Arab war against the nascent Jewish state. If the Arabs had agreed to compromise and accepted Israel into the region, rather than launching a war of annihilation, there wouldn’t have been even one Palestinian refugee. By 1965 the UNRWA’s definition of whom it would serve had been changed, first, to the third generation of refugees – born after 14 May 1948 – and by 1982 to all generations of descendants, totalling upwards of 5 million people. Though Beaumont later notes criticism from “Israeli political figures and pro-Israeli commentators” that UNRWA perpetuates the refugee problem, he writes nothing to indicate that the arguments of such “critics” have merit. As Israeli journalist Ben-Dror Yemini noted on these pages, the High Commissioner for Refugees (UNHCR), which deals with all the world’s non-Palestinian refugees, has somehow taken care of fifty million people. Unlike with UNRWA, they received initial help and they are not refugees. UNRWA’s expansive definition of who qualifies for “refugee” benefits – which includes the children, grandchildren, and great-grandchildren of Arabs who may have once lived in Mandate Palestine – means that 99% of their clients are NOT in fact refugees. Under UNRWA’s bizarre rules, even Palestinians who are now citizens of other Arab states – such as Jordan – are still considered “refugees“. Beaumont then praises the ‘social services” provided by UNRWA. The agency’s main task is to maintain and provide services – including education and healthcare and relief during times of conflict – in the large network of camps, the most substantial of which are in Gaza. In particular UNRWA schools educate 500,000 pupils across the region. The UNRWA has faced criticism from Israeli political figures and pro-Israeli commentators over a number of issues, most significantly….over issues of neutrality. However, as blogger Elder of Ziyon has documented, countless UNRWA teachers and school officials promote antisemitism and celebrate terror. These posts reveal literally dozens of examples of jihadist, antisemitic and even pro-Hitler comments by UNRWA employees. As far as violations of “neutrality”, Beaumont fails to mention proven examples (some even cited by the Guardian) of Gaza terrorists, during last summer’s war, hiding rockets and other weapons in UNRWA schools. In a subsequent passage, Beaumont even falsely suggests that Israel intentionally “targeted” UNRWA facilities during the war, while failing to acknowledge that terrorists fired rockets from near those same UNRWA facilities or, likely, directly from some of these facilities. Near the end of his piece, Beaumont refers to the blockade. In Gaza, the agency says, the long-term effects of the joint Israeli-Egyptian blockade have seen those going to the UNRWA for food assistance rise from 80,000 in the year 2000 to 860,000. Beaumont neglects to note that the Egyptian blockade if far more severe than the Israeli blockade. Indeed, Israel has no restrictions on food or other purely humanitarian supplies sent to Gaza, even during wartime. All that’s restricted are weapons and dual use items – items which can be used for terrorist activity by Hamas and other violent groups. In fact, the word “Hamas” doesn’t appear at all in Beaumont’s 440 word article. Of course, the omission of Hamas – or even the hint, in any context, that Palestinian “refugees” possess moral agency, and are at least partly responsible for their situation – is emblematic of the Guardian’s coverage of the region. In some ways, it makes perfect sense that Beaumont would be celebrating UNRWA. The agency is the institutional embodiment of liberal racism, the insistence on infantilizing “oppressed groups” so that they are never held responsible for their own destructive and self-defeating behavior – thus ensuring a constant need for Western aid and other manifestations of faux liberal ‘benevolence’. UNWRA was established for the sole purpose of creating on going misery and suffering to somehow blame the Jews for the actions of the Islamofascist terrorists. What is the purpose in having a body such as the UN? I know why it was set up 70 years ago, but is it still fit for purpose? Or even needed? When you have established what it is for, is it the most efficient and cost effective way of delivering that purpose or need? If it has no purpose or there is no need for such a body, or if it is NOT the most efficient and cost effective way of meeting that need or purpose. Then clearly the ‘best bit’ of the UN will be when the job creation scheme it has become is scrapped and all the real estate it has throught the World is sold off and used for a better purpose. The best bits of the UNRWA are the FB pages of its educational staff inciting terrorism and Jew-hate and the open antisemitism of their spokesperson Gunness. That the Guardian applauds this organization is logical, natural end expected. A former BBC reporter and head of UNRWA, Chris Gunness, uses Mondoweiss and Electronic Intifada as “news” sources. It fits. All four engage in war propaganda against Israel. You are right, perfectly logical, natural and expected. In the immortal words of John McEnroe: “You can’t be serious!”. But of course, the Guardian is serious. Very, very stupidly serious. UNRWA is the posterchild for everything that is wrong with the UN. A political circus where over-paid, over fed bureaucrats live a life of luxury while grandstanding fro the poverty-stricken millions back home buy spending their days thinking up new ways to condemn Israel. Couple this with McGreal’s article about the UN, with all its ridiculous arithmetical errors and lack of research over the veto issue, and it is clear why the Guardian admires it so much. They look in the mirror and see the UN. Unlike UNHCR, UNRWA’s mission is not aid and resettlement of refugees, but rather an exercise in nation building to counter and eventually annihilate Jewish national independence. Beaumont’s mission is to help create and maintain low information voters for this scheme. Deciding what is “best” depends on individual criteria. For Beaumont’s criteria, it is the best and it’s no surprise that he is Harriet Sherwood’s successor, that fits The Guardian’s own criteria for its mockery of journalism. 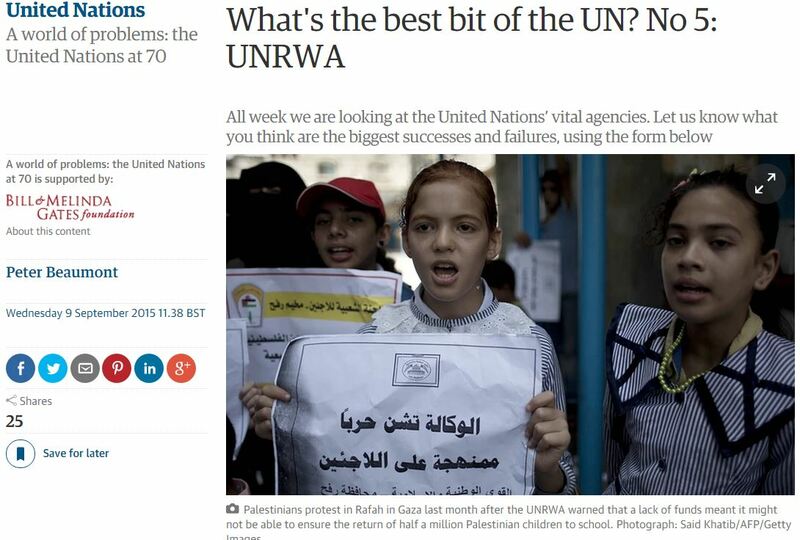 The idea that UNRWA is the best bit of the UN is beyond bizarre. If funds are lacking for what passes for education in these schools (of terror and Jew hatred) as the photo caption suggests, why not hit up some of Gaza’s Hamas millionaires for a few bucks? Timely writing – I loved the analysis ! Does someone know where I might be able to grab a template 2006 FL DoR DR-18 document to use ?